With Curious George hitting the big screen a few years ago in an animated feature starring Will Ferrell as the Man with the Yellow Hat it’s easy to forget his humble beginnings in Margaret Rey’s simple and adorable illustrations in the pages of H.A. Rey’s Curious George book series. 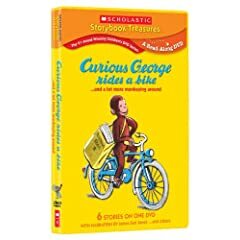 In this Scholastic Treasures collection of stories, George and other animated characters come to life in their original form with a gentle narrator reading the story aloud. It’s the closest thing to hiring a professional to read your child a goodnight story. David de Vries reads the titular story, with Curious George getting into his usual trouble while riding a bike. Other unrelated stories follow, the most notable being “Why Mosquitoes Buzz in People’s Ears” as narrated by James Earl Jones. It’s not the best short on the dvd, but it’s clearly got the most impressive narrator. The complete dvd totals 83 minutes of stories, including the special features – the Curious George and Mosquitoes stories also read in Spanish. The remaining four stories include Fourteen Rats and a Rat-Catcher (the two-sided story of an old woman and a family of rats who have an interesting relationship with the rat-catcher), The Wizard (the best piece in the collection, about a wizard who’s spells pretty much never work), Here Comes the Cat (a wonderfully illustrated and interestingly strange rendition of what happens in a mouse village when a cat arrives), and the live action Frog Goes to Dinner (the story of a boy who takes his pet frog to dinner with hilarious results). All six tracks are reminiscent of a bygone era of children’s entertainment. A time when animation didn’t have to pop out of the screen to catch a child’s attention, and one narrator could provide the voices of all characters involved. Some children may no longer be entertained by this more simplistic style of story-telling, but for the child with an open mind and n appreciation of quality stories, this is the perfect collection of short stories. And Curious George has never been cuter than in the pages of the Reys’ books. 1 user commented in " Movie Review: Curious George Rides a Bike… and a lot more monkey around "
A very nice post. I have 2 kids and they really trouble me up. Hope this helps me a lot for their weekend entertainment.